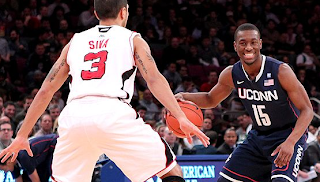 NEW YORK -- Kemba Walker capped the best five days an individual and team may have ever had in college basketball, scoring 19 points to lead Connecticut (No. 19 ESPN/USA Today, No. 21 AP) to a 69-66 victory over No. 14 Louisville in the Big East championship Saturday night. Walker, a 6-foot-1 junior guard, took home the most obvious MVP award in any conference tournament after leading the ninth-seeded Huskies (26-9) to five wins in as many days -- the last four over teams ranked in the Top 25 -- and the program's seventh conference title, tying Georgetown for the most in Big East history. "You know my work. Walk with me." MTV to resurrect Pinfield helmed "120 Minutes"
Chapel Hill Comics: Friday 3/18/11 MONSTER SALE!